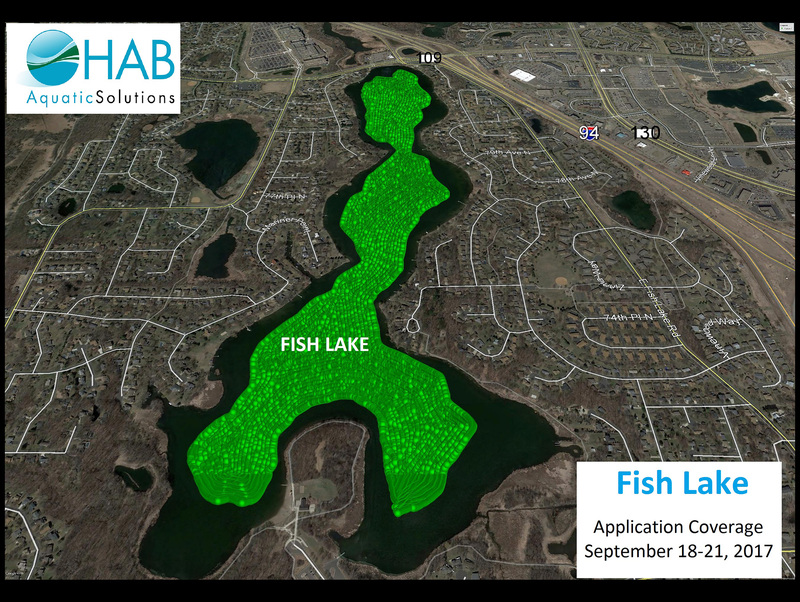 Learn more about the alum application HAB did at Fish Lake in Minnesota at http://fishlakealum.com. Fish Lake is a 232-acre recreational lake in Maple Grove, MN with a maximum depth of 61 feet. The lake is eutrophic with summer algae blooms that can result in odors and unsightly build-up of algae along the shorelines. It is the concentration of phosphorus which controls the level of algae growth. Lake water column phosphorus concentrations now average above the State of Minnesota’s phosphorus standard. A substantial amount of phosphorus has accumulated in the lakebed sediments over the years. The sediments release the phosphorus when oxygen levels decrease at the lake bottom. This leaching of phosphorus from the lakebed is called internal loading and ultimately increases the amount of phosphorus available for algal uptake and growth. Samples from the bottom of the lake confirmed that phosphorus was very high in the sediments and available to be released into the overlying water column. HAB Aquatic Solutions conducted an alum application over a four-day period in September applying the exact dose of over 95,000 gallons of alum in a precise, uniform and safe manner.